The world’s largest independent manufacturer of proportioning and dispensing systems. Hydro Systems also produces dispensing equipment for the animal health industry including medicators and injectors. Create a design to transition the corporate color palate from green to blue and make branding consistent worldwide. Goal was to have a bright, clean, modern, striking, crisp lines and minimalist look and feel. 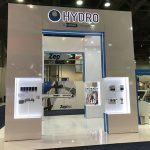 Showcase the new product line and incorporate multiple areas of product display, many of which being fully functional and interactive. Include interactive technology to showcase product. Create an inviting lounge area for demonstrations as well as a comfortable, private conference room for client conversation. The desired bright, clean, modern, striking, crisp lines and minimalist look and feel was conveyed with high gloss white laminates, frosted plex, LED accent stripes, and sharp angles throughout the booth. The Elesgo Super Gloss Artic White laminate flooring was a showstopper, creating a difference from the exhibit to show floor aisle and garnering lots of attention. This type of flooring was avant garde, as it is not typically used for trade shows. An atrium area was created to house several clear or frosted plex product display areas. These displays were mirrored and mount to give the appearance the product is floating. Many of these product displays were fully functional. 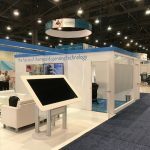 A live demo with pumps and running water flowing alongside a video monitor was mounted to the conference room wall facing the interior of the booth and lounge area and created booth draw. A canopy frame and overhead lighting fostered a welcoming, casual meeting area. Furniture for the lounge area was chosen to look comfortable, but also modern and stay cohesive with the overall clean look and feel. Multi touch large screens incorporated another interactive technology element to showcase product lines. The conference room was built with two full walls and two walls partially open, but connected with frosted plex. An alcove was added to provide more product display as well as a serving counter for refreshments.